Inside: 3 critical decluttering mistakes that are keeping you from decluttering your home and how to avoid them! So you’ve tried decluttering before (maybe even more than once) but got totally overwhelmed, ended up with a bigger mess than you started with, and got burned out. The same thing used to happen to me too. But, I finally found a way to completely declutter my home and it’s changed the way we live and feel in our home for the waaaaay better. Turns out, I was going about it ALL wrong: taking on too much at once, shifting things from one room to another, and unable to stay focused. I’d get stuck trying to figure out which room to declutter first, how to decide what to keep, and how to let go of things without guilt. Sound familiar? 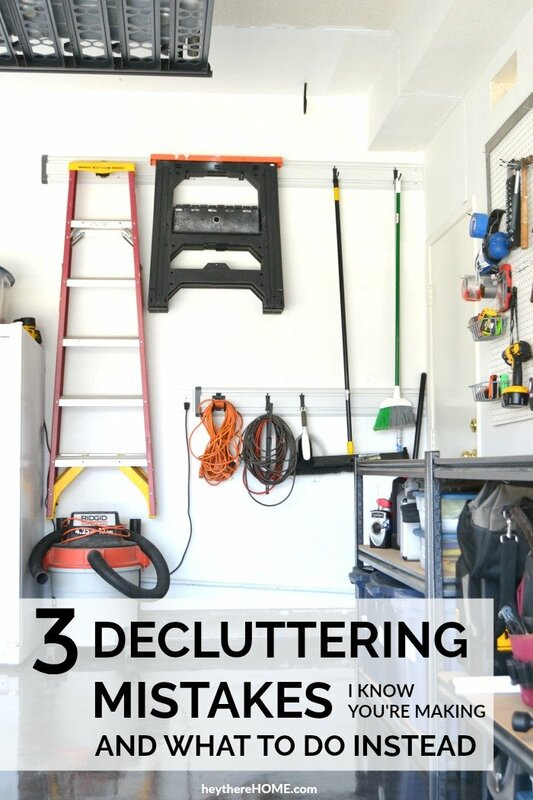 Don’t worry, I’ve got you covered and I’m going to share the 3 critical decluttering mistakes I know you’re making and what to do instead so you can declutter your home without getting overwhelmed. Mistake #1: You don’t stay focused on one area at a time. You start decluttering one room, then walk into another room to put something away, get distracted and start working on that room. Before you know it, you’ve spent most of your time walking from one room to the next and have created a bigger mess than the one you started with. You just spent a few hours without any visible results…ugh. Instead you should focus on one small area at a time and don’t let yourself move on to the next area until it’s done. This may require you to divide up rooms into smaller areas so you have a super specific focus. To get you started I created this free printable decluttering checklist. It will help you divide up areas in your home into small focus areas. Mistake #2: You keep too much stuff! I know you start off with the best intentions, but you quickly find that you’re talking yourself into keeping things you don’t really need or want. You think you might need it someday, that it might come back in style, that it will fit again when you lose weight, or that it’s worth money. You’ve got to be ruthless when it comes to getting rid of stuff if you ever want to love the way you feel in your home again. The reality is, you don’t need to hold onto things that make you feel like you’re not good enough as you are right now. And you definitely don’t need to hold onto things that don’t get used regularly even if you think you might need it someday. I’m sure when that time comes, you won’t be able to find it anyway and will have to borrow it from your neighbor. To create this criteria you should ask yourself 3 simple questions about each item: Is it beautiful, is it useful, or is it sentimental. Asking these three questions and being really real with myself about the answer was the mental shift that took me from stuck to decluttering like crazy. But you gotta be really real with yourself. Learn more about this simple mental shift and how to decide what to keep and what to let go of in this post. You set aside an entire weekend to go through every nook and cranny of your garage but by the end of day one you’re tired, have more piles than you know what to do with, and don’t feel like you’ve made any progress at all. The week begins and the donation pile you created that day sits there for weeks…possibly even months. Instead you should limit yourself to about an hour at a time. That may mean you take on one small area at a time, but anything more than an hour causes burn out, overwhelm, and confusion, which doesn’t ever get you to your goal. Limiting yourself to about an hour will allow you to see one small area that looks and feels really good and it will be the motivation you need to take on another small area. It’s those small wins that give you the motivation to keep going. Want to follow my step-by-step decluttering plan? I’ve created an easy to follow, step-by-step decluttering plan that doesn’t allow you to make any of these mistakes. The Declutter Method breaks down each area of your home for you into short doable tasks so you’ll know exactly where to start, how to divide up large areas into small focus areas, and has scheduled in time to take care of the things that are leaving your home or need to be put away. Click here to get all the details about The Declutter Method.